By dancing, we want to make this sensuous art form directly experienceable and promote cognitive and social skills in children and youngsters. Through individual and creative participation, dance allows a free space in which children and young people can express themselves and implement their own ideas. Emotions and actions, mimic, gesture and whole-body dance movements are expressed. 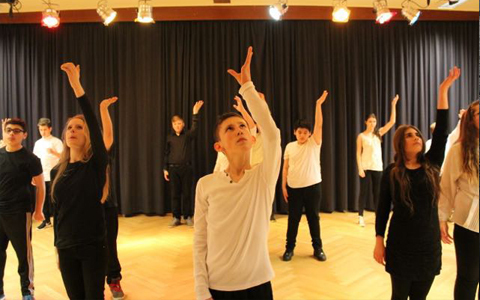 The kids are encouraged to experiment with their own movements and create choreographies together. The dynamic of the dance shapes the personal strength of the individual as well as the relevance as a team member. By achieving shaping skills and sense of success, the personality as well as perseverance and the gain of motivation are strengthened. The training through motor activities contributes to a general increase in movement, to the sensitization of the body language, the feeling of the body and the posture.